Watching what’s going on in UK the last few days – including the long waiting televised debate among the leaders of all the parties - you will think that this is not general election but a reality show. While David Cameron found out that he is somehow related with Kim Kardashian, Ed Miliband is wandering what colour suits his upstairs kitchen, Nigel Garage drinks another pint; Boris Johnson’s thinks that he found the ultimate motto that will attract voters to the Tories: Vote Tory, get broadband. Vote Ukip, get Miliband. But this is just the surface, the peak of the iceberg and under it there is a huge iceberg. The truth is that Cameron, Miliband, Clegg and Farage mirror the general political situation this minute in Europe and the elections will have a great impact in the European future. But let’s take things one by one. David Cameron has proved to be the conservative version of Tony Blair and the only thing that saved his economic policies it was that he followed the American advice instead of the German. Instead of running after an impossible deficit, the conservative prime minster printed more money and started investing creating the impression of a cash flow. And luckily it worked. For the rest of the sector especially in social life his failure was nearly total. Education and health are trembling and his changed only helped the privilege leaving the rest outside. Ironically while the American president fights for medical program that will give a chance to the poor, Cameron seems to rely more and more in the private sector despite the fact that the services of the private sector are more expensive and less effective. But at least in his mind he has decreased the public sector and spending. The Etonian follows in education the principals that want to have money of you want higher education, otherwise straight to a technical school that will create a good worker. In the meantime public education has become the case of loyal to the students’ educators. The north is reliving Thatcher’s times minor the mines and there is absolutely no plan about immigration, the long living British problem. On the other side Ed Miliband. Ed thinks that by declaring Labour is enough to give answers to all the problems. Yes, the Labour governments of the past used to be strong in social reforms, prioritizing health and education. Yes, the Labours traditionally helped the poor and taxed the rich, yes the Labours of the past used to fix every injustice the Conservatives had laid in the country. In the past. And after Tony Blair all that belong to the far away past. The dead past. Tony Blair, Ed’s mentor and guide, transformed the Labour party into a central European socialist democratic party with its roots, not as the Labour tradition, in the working clash but to a party that strongly represents the middle clash. So in the end both the Tories and the Labours fight for the same piece of the pie. Clegg was a joke from the beginning and he didn’t want to accept it. He was used by David Cameron and when his usefulness was over he was thrown to the lions. 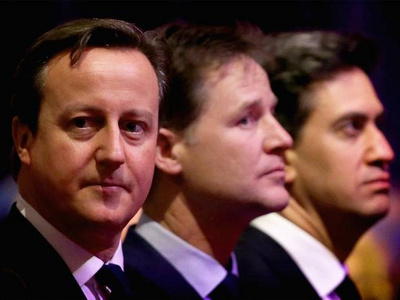 Whatever the liberal-democrats might had represented before this coalition is lost. Now they just look like the left side of the conservative party, ready to obey and vote the most un-liberal and un-democratic laws as long they are not kicked out of their Depute PM seat. Nick Clegg’s public humiliations from Nigel Farage in their televised debates during euro-elections was the beginning of his end. Now he’s even risking to lose his seat in the parliament and if he does the liberal democrats will have to look for a new party not a new leader. Of course there the greens but they obviously need time before they can strongly place a mark in British politics. So what is left is Nigel. 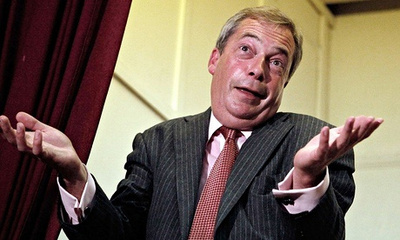 The populist Nigel, the drunk Nigel, the xenophobe Nigel, the racist Nigel; the third party Nigel. Nigel Farage is all the above plus that he is the no program Nigel and crypto-fascist Nigel. But Nigel speaks and he speaks to the part of the population the conservatives could never attract and the part that elected and gave power to the Labours for decades. The working clash. Nigel doesn’t care about the economy, the schools or the hospitals. Nigel only cares for power. His often references to the good old days are the best proof. What were the good old days for Nigel, he has never specify. Were they the Churchill’s era? But that was war, war and war. Was it Thatcher’s era? But Cameron supposedly follows her policies. Was it Baldwin or Disraeli? Nigel probably doesn’t even know who they are. But it is the good old days he wants to return to. When Britain was an empire ruling seas and land. I suppose he doesn’t mean that UK will take over India, Uganda and Australia again. Nigel has invest in the working clash stereotypes. Where the enemy lies in the other side of the channel and eats frogs or sausages, where eastern Europeans are all thieves and south Europeans lazy gigolos. Where Africans and Asian born to serve and Americans to play British music and admire the British accent. So what will happen if this power thirsty man replace Clegg as the third power in UK? The answers are limited and both the other parties know them. This is why Cameron has put Boris Johnson in the front line and Miliband tries to reconnect with the unions. What will happen at the 8th of May 2015 if neither Cameron nor Miliband can form a government alone and the solution is a coalition with third party the Ukip? Will the conservatives make government with Nigel and with what consequences? The fast depart of the United Kingdom from the European Union? Or is David ready to talk with Ed risking a rebellion inside his own party which has a lot of members who wouldn’t mind to work with Nigel? You see nowadays and under the voters pressure a lot of Tory MPs don’t like close encounters with their cross the channel neighbours. Actually they wish the channel had the dimensions of an ocean that would keep them far away from Brussels. The same time the always optimist Cameron thinks that he can make the whole scheme work for him. Even though the Labours seem to lead the elections, Cameron thinks that there is no way for Miliband to form a government with the Ukip, so he will have to turn to him. The same time he thinks that he can handle Farage just like he did with Clegg. And here is where all his bets are coming. Cameron wants to regain power in EU. UK is not in the Eurozone and is not planning to enter at least for long time but Britain is the second biggest economic and military power in Europe and doesn’t like that is treated as the last after even Belgium. Cameron wants back and he wants this time to control things, to influence decisions and not be on the receiving side of the decisions. He wants to lead EU and for that he has the support of most the British people. This is when all the anti-European feelings will die. And for that Farage is the best man in the best place, to scare the Europeans. As long Cameron can handle Nigel. Europe on the other side, and especially Germany and France, don’t have the luxury to lose Britain. Britain out, EU is over. Period. Doesn’t matter what Merkel and Hollande say, EU will not survive just with the German money, however much they have been laundering since the fall of the Wall. EU needs the competitive and stable British economy. If Germany wants to keep Britain in EU – because we are down to that – EU has to change, German economic dogmas have to change; EU has to return to its fundamentals. Otherwise Farage won in the EU front using Cameron as his Trojan horse. 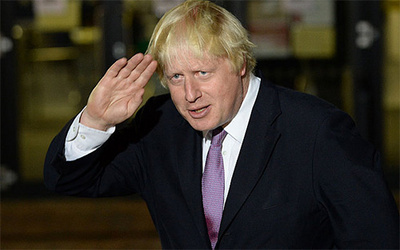 The televised debater among the leadership of the British politics was another part of this reality show that reminds more the show “Big brother” than “Britain you got a talent”. All sides said the same thing with different words and all of them kept political correct so much that you could say that they were lying. With the whole of Europe watching the Brits are heading for the elections without care of the consequences of their vote, they are not informed because nobody cared to inform them. Sadly afterwards everybody will ask them to take the responsibility for what they brought down. The current political situation in the UK and EU, not to speak of Western civilization as a whole, has reaches such a bizarre and surreal level as to appear Fellinesque. Life as a circus is in fact the key to understanding Fellini’s movies. That metaphor saves his work from utter despair at the decadence of the human condition and allows him to create his great works of art. The works of art in turn become harbinger of salvation and redemption for those who view and understand them. Thanks for bringing in the clowns Thanos.